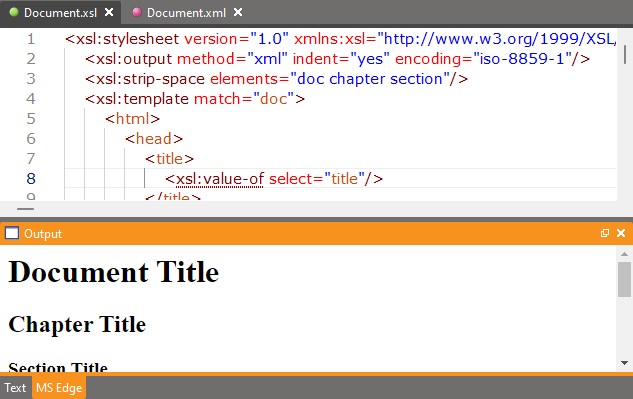 In XMLBlueprint you can edit an XSLT Stylesheet in the same way you can edit any other XML Document. In addition, you can apply the XSLT Stylesheet ('run the XSLT Stylesheet') to an XML Document and the result is shown in the Output view. Note that you switch between the Text and IE view by clicking on the Tabs on the bottom of the Output view. To transform the active XML Document you have to first specify the XSLT Stylesheet, press F9 (Or XSLT > Run XSLT Transformation) to run the XSLT transformation. The first time the Setup XSLT Transformation window will automattically show. The second time the transformation is applied immediately. If later on you do want to specify an other XSLT stylesheet, go to the XML Document and press Ctrl+F9 (XSLT > Setup XSLT Transformation) to open the setup dialog again. Use Choose> to choose one of the active documents. To run the active XSLT Stylesheet you have to first specify the XML document, press F9 (Or XSLT > Run XSLT Transformation) to run the XSLT transformation. The first time the Setup XSLT Transformation window will automattically show. The second time the transformation is applied immediately. If later on you do want to specify an other XML document, go to the XSLT Stylesheet and press Ctrl+F9 (XSLT > Setup XSLT Transformation) to open the setup dialog again. Open output in browser -- The output of the XSLT transformation will be displayed in the default browser. 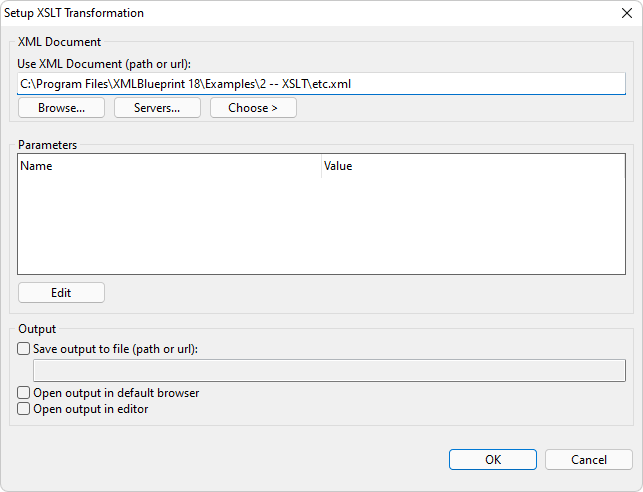 Open output in editor -- The output will be displayed in XMLBlueprint's editor.